Every month or so, a new horror movie hits #1 at the box office — no wonder there are dozens of new fright films slated for release each year. But should you find yourself trapped in one of these movies, there's no need to be afraid. 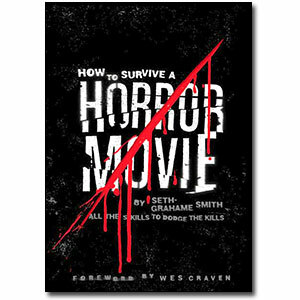 How to Survive a Horror Movie will teach you how to cope with every kind of horror movie obstacle, from ax-wielding psychopaths to haunted Japanese VHS tapes. Chapters include: How to Survive a Night of Babysitting; How to Convince the Skeptical Local Sheriff; How to Perform an Exorcism; How to Tell If You've Been Dead Since the Beginning of the Movie; How to Vanquish a Murderous Doll. Seth Grahame-Smith is the author of The Spider-Man Handbook. He lives in Los Angeles, California. Wes Craven is the director of A Nightmare on Elm Street, Scream, Last House on the Left, and other classic horror movies.